Our previous work found that perceived control over life was a significant predictor of the quality of diet of women of lower educational attainment. In this paper, we explore the influence on quality of diet of a range of psychological and social factors identified during focus group discussions, and specify the way this differs in women of lower and higher educational attainment. We assessed educational attainment, quality of diet, and psycho-social factors in 378 women attending Sure Start Children's Centres and baby clinics in Southampton, UK. Multiple-group path analysis showed that in women of lower educational attainment, the effect of general self-efficacy on quality of diet was mediated through perceptions of control and through food involvement, but that there were also direct effects of social support for healthy eating and having positive outcome expectancies. 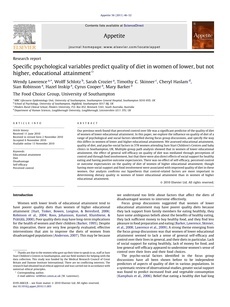 There was no effect of self-efficacy, perceived control or outcome expectancies on the quality of diet of women of higher educational attainment, though having more social support and food involvement were associated with improved quality of diet in these women. Our analysis confirms our hypothesis that control-related factors are more important in determining dietary quality in women of lower educational attainment than in women of higher educational attainment.